In seventh grade science, kids learn about topics such as cellular organization, the types of rocks and minerals on Earth and how net force impacts an object’s motion. Help your seventh grader master these and other such science topics with fun and interactive seventh grade science games. School of Dragons presents kids with a fun and exciting way to learn about scientific topics. 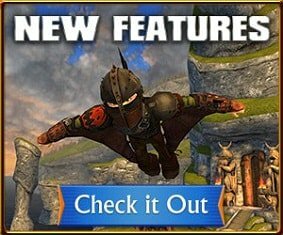 The science-based quests in this game combine the exciting world of ‘How to Train Your Dragon’ with the fascinating world of science. Kids get practice using the scientific method of enquiry to learn more about the world around them. They also get to explore various scientific topics in a hands-on, interactive manner that can only be possible through online science games. Since gronckles love rocks, players are sent to collect metamorphous rocks, igneous rocks and sedimentary rocks as a gift for Meatlug. This science game is a great way for seventh graders to practice recognizing the different rock types, and telling the difference between them. It is also a great introduction to the rock cycle. Players help Ruffnut figure out what homemade solution works best as a cleaning agent. Working with three solutions – salt and vinegar, vinegar and baking soda and salt and baking soda – players use a soiled coin to see which one works best. Apart from reinforcing the importance of using the scientific method, the science game also introduces concepts such as acids, bases, chemicals and chemical reactions. Each of the science quests in the School of Dragons is supplemented by additional information available in the field guide. This encourages students to read more about topics that interest them, and conduct independent research on subjects that they’d like to know more about. Use the fun science games in the School of Dragons to instil a love for learning and science in your seventh graders. Why Science Games for Kids? Like math, science gets more intimidating the closer your child gets to high school. Science concepts get more advanced in 7th grade and he will really need to sharpen his study skills this year. It’s easy to panic when you have to write lab reports and study independently for tests. But isn’t science supposed to be a fun subject since it is so immediately connected with the world around us? And how does a science-hating youngster cope with the sudden onslaught of incomprehensible scientific jargon? 7th grade science games have the answer. They help your child understand important scientific topics and, more importantly, retain the knowledge he has gained. They are designed around the science topics your 7th grader will study and are highly interactive in nature. 7th grade science games are loads of fun to do – your child never gets a chance to get bored! 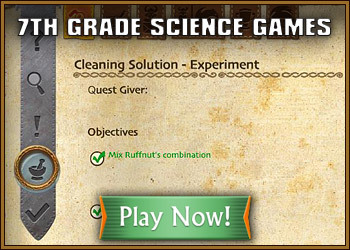 Give 7th grade science games a chance – try them today! He can also browse through these free science games for 5th and 6th grade to strengthen his basics.